If you haven't noticed already I sure love change. I'm constantly moving furniture around because it just sets a new, fresh vibe each time. I put together a new header because I'm in a B&W sort of mood. I'll keep it like this for a while.. maybe. It's funny how much of life is black/white. I was browsing through my photo albums as I must do almost every day (side note: thank god for the existence of cameras)! I came across one of my favorites I took on one of Charlie & I fabulous day trips. It was in the winter as you'll see the snow on the ground and we were at the beach.. as you'll notice the huge Lifeguard tower taking up the picture. The reason why I love this photo is because of the sign. 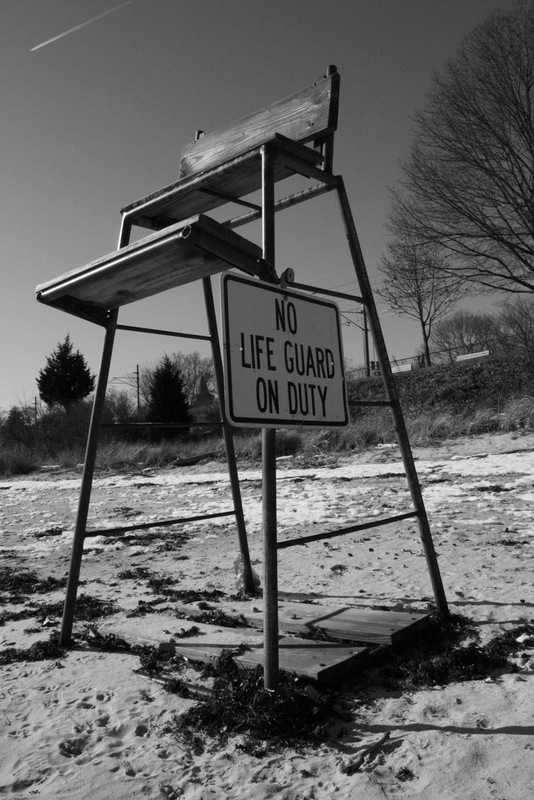 Of course whoever manufactured this sign meant only one thing and that is 'No Lifeguard on Duty'. When I look at the sign and those words... I think of life and how there truly is No Lifeguard on Duty watching us. We're making decisions that can effect our lives negatively or positively. We're not told when we were able to understand that at times in our youth there will be no one following us around when we're out of view, except for our own conscience. We were also not told that when we are old enough to live on our own we're literally on our own. It's like that mama bird just pushing the baby out of the nest (Adios baby)! Now that's not such a bad thing, it's all what makes us individuals. I feel that as a kid my parents raised me well enough to feel guilty if I did something bad. I knew right from wrong. Did I still do things wrong, of course!